You want more web traffic. And the best way to drive traffic to your site is to show up on the first page of Google. And to do that you need SEO (search engine optimization). Or rather you need to hire the right pro to do the SEO for you. Of course, to hire the right pro, you also need a basic grasp of the topic. In this massive guide we’ll cover every aspect of your online presence, and then explain how an SEO expert can help. Do Paid Ads (On Google Or Facebook) Help SEO? If you got a random email saying you are failing at SEO, pump the brakes right there. Maybe it talked about your “critical website errors”, or how you are missing out on traffic from Google. These types of emails come from everyone ranging from scammers to bottom-barrel “SEO Experts”. Most of the stuff they say in the email is bogus anyway. Once you finish this guide, you’ll be able to sniff that stuff out right away. So just like we talked about finding the right SEO pro at the start, we also need to be aware of the wrong SEO pro so we can avoid them. Now let’s assume you are actively seeking SEO help. You ask around or maybe you even Google some providers. Maybe you get a referral. The right SEO pro will offer to do a quick audit on your current presence. They’ll spit out a report to see where you are at, and what could be improved. Don’t be too impressed by this, by the way. It takes about 2 minutes to produce from the industry-standard software that any good pro uses. But it’s a useful starting point. What Does A Real SEO Audit Reveal? First they’ll check out what keywords you rank for (if any). Then they’ll see what position you are in for each of those keywords. Every page of Google search results has 10 spots (positions). The goal is to get into the top 3 — that’s where you get the most clicks. Beyond 10th place and you are on the second page, or worse. Meaning no one will ever see you. You may have a bunch of different pages for each service, or you may talk about products instead, but you get the general idea. The small biz website usually has less than 10 pages. Which is fine — there is no prize for having a large website. To start, the right SEO pro is going to focus on the pages of your website that will be of the most interest to your customers. Those are usually the Service(s) or Product(s) pages, and the Home page. Now, the wrong SEO pro, he will start talking about every little insignificant thing. The right pro doesn’t assume anything at this point. He can see what the story is right now, but he still doesn’t know where you want to end up. For instance, if you have never put any thought or effort into SEO, your site might be ranking for the wrong keywords. And just assuming that he needs to improve your rank for those keywords would be a big waste of time. But let’s not get ahead of ourselves. We’ll talk about right and wrong keywords soon. What the right SEO pro will do, is he’ll use the audit as the starting point in your conversation. He’ll try to find out what you actually offer, and what your customers care about. Then he’ll ask you what you think you should be targeting. This is just info gathering, picking your brain, so he can go off and form a strategy. Where Can You Improve & How Much Will It Cost? You may find out you already rank in the top three Google spots for industry-related searches in your area. We’ve seen it happen before. Clients get one of those scary emails and ask us to check on their SEO health. We do a couple quick searches and they are coming up first or second for every one. But even if you are coming up first for all the keywords you think they should be targeting, maybe you are still getting very low traffic. There may not be a lot of demand for what you are offering. Or the people who do want it might not go onto Google to search for it. So if you are already ranking high, but the traffic and sales are just not there, pouring money into SEO may not be the best bet for you. Consider other forms of advertising where you go to your prospects (like Facebook Ads). But that’s a rare case. Most times the SEO pro will see some room for improvement. Once you give him a general lay of the land, he will be able to check out the competition and come to you with a quote. It really varies from business to business, and especially area to area. We’ve seen SEO proposals ranging from $500-$1000 month. A higher proposal typically means that there is stiffer competition for the popular keyword searches in your industry and area. If it fits your budget, it’s time to see what actions the SEO pro is proposing. When we say “keywords”, we mean anything that people might type into the Google search. It could be one word, it could be a very long sentence. The wrong SEO pro is going to ask you what keywords you want to target. The right SEO pro is going to ask you what keywords you think you should target, and then do some research to see what you actually should target. They are rarely the same thing. The monthly volume aspect probably makes sense to you. But what do we mean by “intent”? Well, some people are really lazy when they search. If they type “chef Winnipeg” into Google, can we really tell what they are looking for? Do they want to hire a chef, or do they want a job as a chef? The right SEO pro will focus on getting you ranked for the keywords with clear intent that matches your offer. The volume + intent matchup is very important, and sadly most often neglected. Business owners neglect it because sometimes they are too close to their business to consider it clearly. And the wrong SEO pros neglect it because it takes effort and they just want to get your contract started asap so they can get paid. Keyword research is the only way to execute a proper strategy instead of shooting in the dark. Do You Always Need To Do Keyword Research? Now there are some cases when you don’t need keyword research. If you have less than 3 competitors in your area, you don’t have to worry too much. You can do some simple On-Page SEO, which we’ll talk about in a bit, and you will be fine. But for everyone else, the right SEO pro is going to have to brainstorm. He’s thinking of what kind of words your clients use. Maybe you can help give him some ideas. The most important thing here is to stay away from internal slang that only you use, especially if you sell B2C. If you sell B2B, chances are better that your clients know and use jargon or technical words. But consumers tend to use informal phrases. Think “house cleaner” versus “residential cleaning” (consumers rarely, if ever, use the word “residential”). A large concrete company in Calgary wanted to branch out their advertising. They mainly focused on industrial bids, but there had been a slow down. So now they wanted to also target local homeowners for things like sidewalk and driveway paving. When the SEO pro asked them for keywords to focus on, they kept saying “privates”. To them, that meant one-off residential jobs. To nearly everyone else on earth, it means what’s in your underpants. Needless to say, no potential customers were on Google searching for “privates”. Anyway, back to your website. The right SEO pro will ask about your direct competitors. He will check what keywords they rank for, which will generate more ideas. He’ll take your list, and his brainstorming, and the stuff he got from your competitors. He’ll run it through his SEO software to get all the search data. He’s going to check for keywords that have a lot of monthly searches and low competition. Those are the treasures. Usually, the high quality / high traffic keywords have a lot of other high quality websites competing for them. Looking at total monthly searches for one keyword is less important than looking at the estimated monthly traffic of any page. You or the SEO pro might have some great ideas for keywords to target. They feel right. You know your customers use those words. But when he runs the keywords through the search software it will say “0 monthly searches” or “no data”. That usually means that people search for that keyword less than 10 times a month. So does he just reject that keyword? Maybe not. Here is where the smart SEO pro dives deeper. See, web pages rarely rank for just 1 keyword. So the page that currently ranks third for “Winnipeg maid service” (less than 10 monthly searches), also ranks for a bunch of other keywords, given the context of the page. 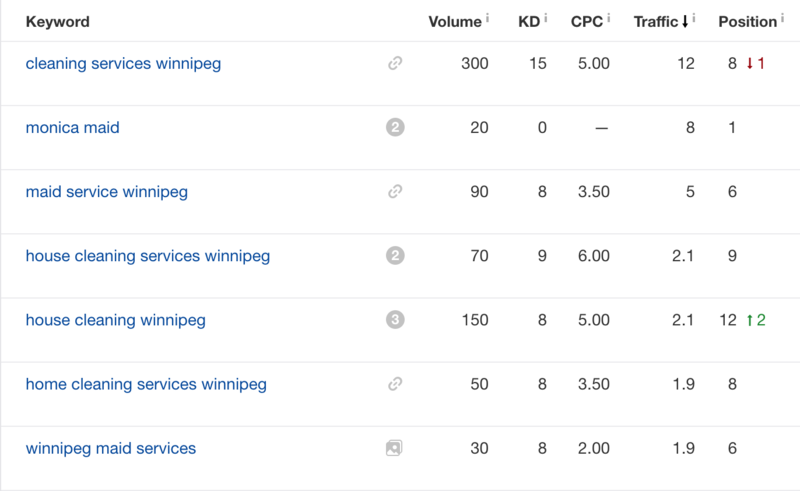 In that example, you can see — even though the keyword “Winnipeg maid service” has a super low amount of volume — that the third-ranked page still gets a solid amount of traffic. That traffic is coming from a few searches here, and a few searches there, of a bunch of different keywords. Some of the keywords are really low-traffic, so they only pull in a few visitors per month. But that all adds up. The third-ranked page is going to be easier to compete with than the top two results. So your SEO pro could target them, see what they are doing, and how your site could do it better. And you could then expect to get roughly the same amount of traffic they are getting now. This is a very simple example of that concept, and the point is that the right SEO pro is going to be exploring all these angles. So if you have done any research on your own, and you have all these high-traffic keywords you want to target, they might be unrealistic. But focusing on a so-called “low traffic” keyword might still bring you a lot of new website visitors, and will be way easier to compete for. With all these things in mind, your SEO pro is going through and making a list of keywords. Since you have a simple small business website, he’s narrowing it down to maybe 3-5 main keywords to target. It’s shockingly easy to target local customers with your SEO. Searchers may not include the name of the area in their search, but Google is smart enough to see where they are and prioritize the results for that area. Now, with voice searches, people have started saying “near me”. As in, “bakery that is open near me”. The wrong SEO pro may suggest a silly tactic like including “near me” in your keyword, but that won’t help at all. Remember — Google is about context and searcher intent, not matching the exact phrases people type into the search box. The right SEO pro is going to ask about the areas you serve, or where you want to target. Typically they will add the main city name to your keyword. But depending on the size of your city, they might go for a county name (if you are in a small town), or a neighborhood name (if you are in a big city). Now if you serve a bunch of different areas, the wrong SEO pro might try to stuff them all into the keyword. But the smart play is to just target one. The right SEO pro will present you with a list of the keywords he wants to target. Your site may already be targeting some of the keywords. That’s okay. At least you know you are on the right track, and you have a measurable plan to check against in the future. It’s time to move onto the next step, and look at the pages on your website that he will be optimizing. He’ll look at the actual words that are on those pages — our example from before was Home, About, Services — and see which of the keywords on your list are the best match for each page. The wrong SEO pro will just stick in one keyword phrase per page, regardless. The right SEO pro will ask himself if the content on those pages really relates to the keyword you want to target. And he will evaluate if this content will satisfy the searcher who is looking for it. If the content is lacking, the right SEO pro will then focus on improving the copy. By copywriting, we mean all the text that is on your pages — the specific words you use and the way those words are arranged. Copy is a polished craft, mostly beyond the scope of this article. But there are some basic ways to approach copy that will make your SEO efforts a success. So right off the bat, the right SEO pro is at least going to care about the copy. The wrong SEO pro will either ignore it, or just suggest a bunch of mash that they’ve used for other businesses, without considering the needs of your audience. How Many Words Do You Need To Rank On Google? On average, pages that rank near the top of Google have more than 1000 words. Can you rank high with a short page and few words (what is called “shallow content”)? If you want help with SEO in the first place, and you already went through the Keyword Research step, it’s likely that those factors don’t apply to you. A bunch of jumbled words, just to get over 1000 words per page, are not going to help. Obviously the content should be informative and useful. If you already say what you do and who you do it for, and you’ve included all the pertinent info about your offer, then the SEO pro might not have to change anything. It’s not necessary to include your target keyword over and over on the page. If your SEO pro suggests copy with the same keyword repeated throughout, that is a red flag. It’s not necessary for Google, and it’s really a pain to read for a human being. Also, if you have a lot of fluff wording on your site, you need to mentally divorce yourself from it (especially if you wrote it), and cut it out. Notice that none of those examples are specific, and none of them address how you help the searcher (your potential customer). Your SEO pro may not be a master writer, but at the very least each page should have a headline saying what the searcher gets, and where. The second one is not fancy at all. Yet it says plainly what you offer, within 2 seconds of the searcher landing on your site. It also has a keyword (with an area included). So that’s an easy fix. Another copy mistake is using a vague slogan, unless your brand is already very well known. Slogans like “helping you help yourself” or “committed to safety” don’t mean anything, and certainly don’t set you apart. People don’t search for “committed to safety”. Now, if your industry has safety issues, such that customers always ask about them and they can become a selling point, then include them. But be specific about it. What specifically do you do to be safe, how does it help the customer, etc. The good SEO pro is going to pick your brain on all that before suggesting new copy. Lots of people believe that, because they don’t like to read, that none of their customers will bother to read. Test after test after test proves that wrong. Longer copy tends to (but not always) convert better and rank better. It’s not because people read all the copy, but they scan through for something relevant to them on that topic, and if they don’t find it they are gone. As the decision-maker of a small business, you hold most of the answers. The right SEO pro is going to ask you a lot of questions, and to you they are probably boring or obvious. He should be asking who your customers are, what they care about, what they need to know in order to take the next step. This info, combined with keyword research, is what makes for great search-friendly content. Note: writing for traffic and writing for conversion — to get leads — is not always the same skill. The right SEO pro is going to be focused on the main goal of getting you more traffic. That is how you can judge if his service is working for you. Whether or not that traffic converts into leads or sales, that is on you. Or maybe it is the next step for the pro, once the traffic issue is solved. But be clear — copy does matter if you want more web traffic. It’s very hard for small businesses to accept that they need help with copywriting. Even when they recognize that they can’t do it themselves, they hire some former schoolteacher or a corporate-trained HR type. Such folks often write to “sound proper” or to “be professional”. Neither of those will help with SEO or sales. You would be better off recording the pitch of your top salesman / account manager, and transcribing it word for word. Bottom line, look for the right SEO pro to ask you about the copy at the very least. Extra copywriting may be beyond the scope of your SEO job. It is an issue of price and time. If you are paying for a bargain SEO package of a few hundred dollars a month, chances are they are not going to include an amazing copy re-write. But maybe they will suggest simple changes like the headline example we just covered. Once you have your keyword list and the copy is finalized, it’s time for the SEO pro to check the other website elements that are going to help improve your page rank. It means that tweaks are done to your website code, so that your main topics are clearer to Google. Since these actions take place on your web pages themselves, it is called “on page” SEO. Your SEO pro will check each On Page factor to make sure it is set up properly. While all these factors help, they are not the single important thing stopping you from getting all the traffic you want. A lot of people find out about On Page SEO, see that they are doing one thing wrong, and blame that for their lack of traffic. Like everything we’ve already talked about, changing one factor on page is not going to matter if you target the wrong keywords or have poor content. When Does On-Page SEO Really Move The Needle? The right SEO pro will spot easy-win opportunities. After doing the keyword research, approving the copy, and checking your competitors, he may see you all offer roughly the same thing, with the same info. At least in terms of your websites. In that case, some On Page SEO tweaks are all that are needed to be in the top three results. So, while On Page is not the magic pill, in those cases it can be the fastest and cheapest way to improve your SEO. Because it is by far the easiest SEO step to control and to deploy, it may as well be done right. This tells Google the main point of that page. It typically matches, or is closely related to the headline on the page itself. It helps your page get indexed for your target keyword. It also shows up on searches. So in that sense it functions like the headline of an “ad” to click on your website. 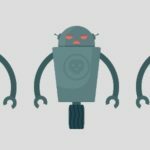 That is a fancy way of saying that the title tag affects the actions of robots (Google) and humans (searchers). The vertical line is called a “pipe”. Pipes or dashes, it doesn’t matter how your title is separated. Google will only display a limited amount of characters in the search results. So most SEO pros keep their titles below 60 characters. But this changes from time to time, and it also depends on the kind of screen used to search (mobile or desktop). No one knows how many keywords Google indexes from the title. Your SEO pro might write a much longer title in order to fit in more keywords. The main thing to watch for is that the main keyword is first. The right SEO pro will also make sure each of your web pages are optimized for a unique title tag. On a small business website, no two pages should be targeting the exact same keyword. Some SEO pros choose to have the company name appear first in the title for one page on your website. That is fine, as long as it is only one page that otherwise wouldn’t have ranked for any special keywords. At Websites.ca, we always setup the Contact page so that the full business name appears next to the area that the main office is located. As of 2018, Google doesn’t weigh the description tag towards your page rank. But since it still appears in the search results, it is a powerful persuasion tool to get searchers to click on your page. If more people click on your page, Google WILL weigh that as a signal to rank you higher (or keep you ranked high). The wrong SEO pro will fill the description with variations on your main keyword, which reads poorly, persuades no one, and does not help your rank. The right SEO pro will pull one or two sentences from the web page itself, that show the benefit of the info on that page. Even so, Google has now started showing a different page description to searchers, depending on the word choices the searcher is using. The words Google chooses will be taken from the web page, but won’t necessarily be the same words that the SEO pro entered as a description. So this is the least important On Page SEO factor. It’s actually a great red flag, if an SEO pro really emphasizes how you have bad page descriptions and he is going to fix them, he’s really focused on the wrong things. Like we discussed in the copywriting section, effective copy has a relevant headline. And long copy (over 1000 words) is easier to read when it is broken up by sub-headings. Well, web designers can designate certain text on the page as the main headline (h1), and the sub-heads (h2-h6). The good SEO pro is going to make sure your main target keyword is in the headline, and that any supporting keywords are in the sub-heads. Google sees the highest-numbered heading tag as the headline of that page. So if your page has a line tagged as “h2” in the code, but no lines as “h1”, they will just treat the h2 line as your main headline. Google uses the words in the headline as one of the ranking factors for your page. This is the specific page address. Typically it is just the name of the page. But it may be another place to add the keyword, if appropriate. The right SEO pro will see if he can add the keyword to the page name, while keeping it as short as possible. To explain, let’s imagine a plumbing company in Winnipeg called Mr Drain. Their website is www.misterdrain.com, and they have three pages — Home, Services, Contact. But the SEO pro wants to target the keyword “emergency plumbing Winnipeg” for this imaginary company. Note: this tactic only applies to internal pages; the Home page will just be the domain name. If the SEO pro ends up changing any urls, he will also setup a “301 redirect” from the old page name to the new page name. That means if anyone types in the old url, or clicks an old link somewhere on the web, they will still end up on that page (instead of getting an error). Where possible, the SEO pro will link text from one page on your website, to another page on your website. This becomes more important the larger your site becomes. 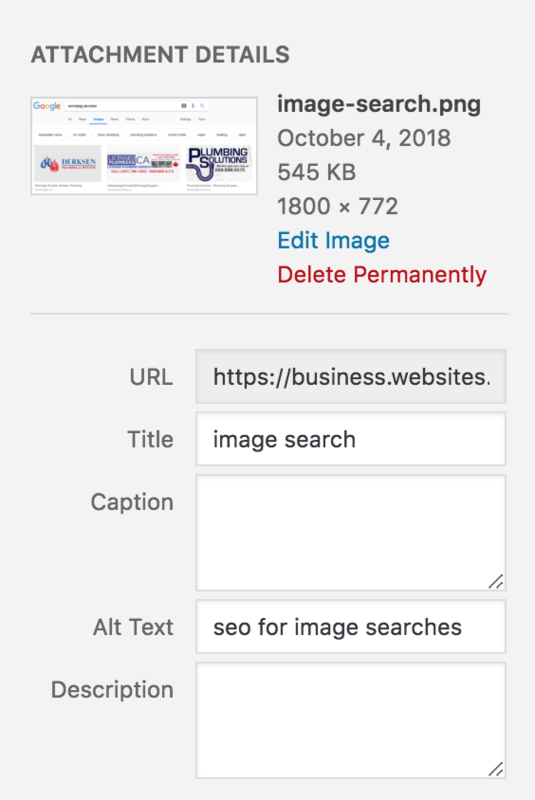 Since we keep using small business websites as our example, the most obvious thing would be to put a link from the Home page to one of the internal Services pages. The right SEO pro will use “anchor text” in the link. Anchor text means words that tell the website user what they can expect to find on the linked page. These words relate to the target keyword of that page. Let’s go back to our imaginary plumbing company. We know that the Services page is optimized for “emergency plumbing Winnipeg”. The wrong SEO pro would either miss that internal link opportunity, or he would hyperlink the “we are available” part. 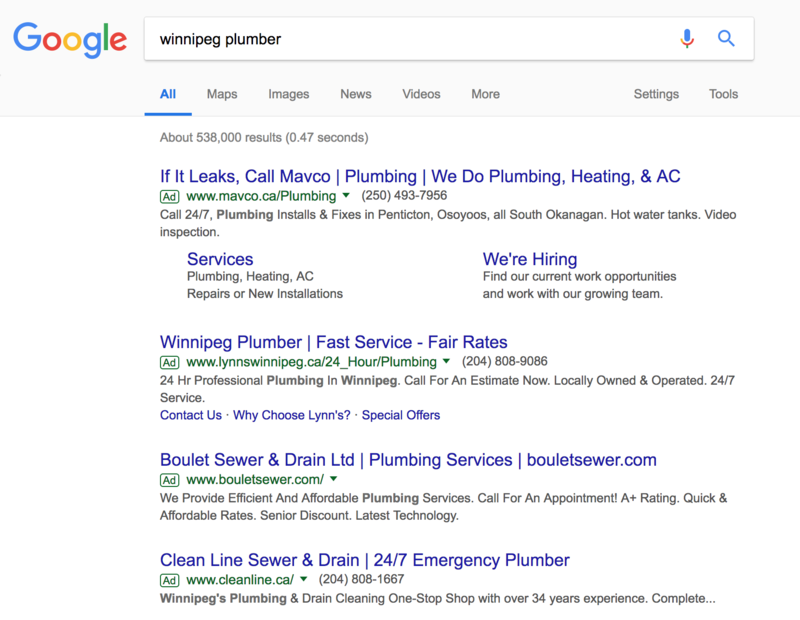 The right SEO pro will recognize that “24/7 plumbing help” is a great supporting keyword for his main keyword “emergency plumbing Winnipeg”. Internal linking becomes much more powerful when used with a content marketing strategy, which we will talk about later. When Google scans through your site, they are also looking at the images. That way they can add anything relevant to their image search. If any of your pages use images, the right SEO pro will optimize both the image names and the “alt text”. Alt text is something that may be used if, for instance, a blind person is using a screen reader to tell them what is on a website. Since they can’t see the image, the screen reader uses the alt text to describe it instead. But the alt text is also a great opportunity to squeeze in your main keyword, and it counts towards the Google index. Again, adding keyword alt text to one image on your page is not going to catapult you to the top of Google. It is just one, of many, small tactics that an SEO pro may use in a full SEO strategy. Google wants to deliver the best possible experience to its searchers. Part of that, like we already said, is matching their intent with the results they are shown. But when those results are clicked, they also want the website to load fast and be easy to use on all different devices. The right SEO pro will make sure your site is reasonably fast and works on mobile displays. But a lot of that may be under the control of your designer. In cases where the SEO pro identifies a problem, you may have to put them in touch with your website provider so they can work together to fix the issues. There are many easy ways to tell if your website is mobile friendly. The simplest is to just pull it up on your phone and see how it looks. The page speed is a slightly different topic. Most modern websites load very fast. Overly large images are usually the one thing that makes a page load slower. That can be easily fixed by a web designer. Also, if your page has a lot of different elements, like an image slider, various text boxes, social media feeds, and videos… it is going to load slower than a page that is just plain text. But we have found that worrying about page speed is mostly unhelpful. The wrong SEO pro will harp on about cutting down a few milliseconds with coding changes, but totally ignore improving the content for an actual human reader. Outside of an obvious and annoyingly slow loading page, most small business websites don’t have to fret about page speed. To put it in perspective, Google measures Apple’s website as having an average (not fast) speed on mobile, and they say that Facebook has an average speed on desktop. We are not saying page speed isn’t important, or that Google doesn’t use it as a ranking factor. It is, and they do. But Google reps directly confirmed that you would still rank well with good content and a slow-loading page. There may be other pages on your website that could be ranked for secondary keywords. These are keywords that are important, but they are not part of the main list of 3-5 that the SEO pro is targeting for max traffic. The About page on a website, if it is well written and tells a compelling story about the company or the owners, is a great place to target some of these secondary keywords. What else are people concerned about when they search for Italian food? They want it to be “authentic; real home cooking”. We saw a web page jump to the top spot on Google, after they did a major rewrite to their About page. It told the story of how the Italian couple immigrated to Canada, how they learned to cook, and what traditions they are carrying on in their restaurant. Then the SEO pro optimized the page for “authentic Italian food”. See, if you searched for that and were just taken to a menu, how would that be any different than the dozens of other Italian restaurants in the area? But if you’re taken to a page that specifically explains how the food is authentic, now it matches searcher intent. So a good SEO pro will look for those opportunities on your site. Another page type that is making a great comeback is the FAQ page. Voice searches are growing every year. Whether from mobile or from smart speakers like Amazon Echo. The Question and Brief Answer format of an FAQ page is perfect for a voice search. If you have a page like that, or your customers typically ask a few important questions before they buy, then the right SEO pro might see yet another chance to pull in some more search traffic by optimizing that page. How Long Will It Take To See Results From On-Page SEO? It can take Google up to a month to see your changes and then reflect that in their search index. Remember, SEO is a long-term game. The right SEO pro will go through all of the stages we have covered so far. They won’t skimp out or just assume anything. In the world of small, locally-based businesses, sometimes it may be enough to stop at the On-Page stage. They will see, after a month or two, that you are up in the top 3 Google results for your target keywords. At the very least you will have clear goals in mind, and you will have a firm foundation of the ideal search targeting for your industry and offer. The wrong SEO pro may just want to skip all the steps and get right to Off-Page SEO (which we’ll talk about next). They will pick a few high volume, obvious keywords, that have a ton of competition. They will run a simple report that anyone could do with software, and then “fix” a bunch of code-based things that they probably can’t even explain to you. Then they’ll want to start pumping a bunch of low-quality links at your site. 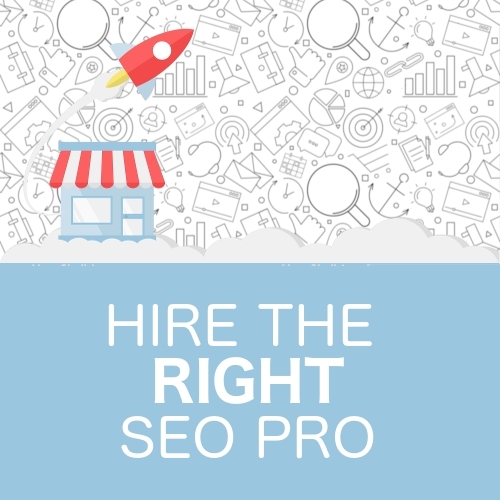 The right SEO pro will set up that strong core first, and make sure they have a firm understanding of your company. But the nature of competition may mean that they do have to take it to the next level. And that is when they will go off your website to expand the SEO strategy. Any actions performed outside your website, that will end up helping your pages rank higher for specific searches, or drive traffic. The most common example is getting another website to link to yours. This covers any place where someone might be able to find your business contact info, like hours, phone, and address. 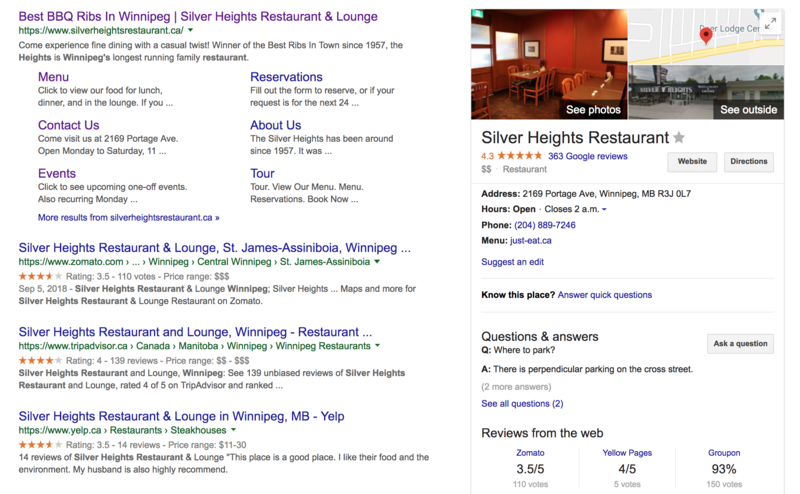 Google likes to see a business that is well-represented on local directories. If you haven’t already done it, the right SEO pro will help you claim or update your Google My Business listing. It’s the most important online business directory. It also helps your placement on Google Maps, and allows you to get Google Reviews. Both of those things will eventually have a positive effect on your page rank and traffic. They will also do a search for your business name, and see what other online directories you are on. The first step is making sure that your business info is up to date on any current listing. Then, if they find a directory you are not on yet, they will set up a listing for you. The directory listing cleanup is important to Google. When they crawl around the internet they want to see that all your business info is consistent. Like anything else, local listings are an important SEO step, but having 5 listings is not going to suddenly guarantee you top spot in any Google searches. Be wary of the wrong SEO pro who brags about all the directory links he is going to get for you. Backlinks are when other websites link to your website. There are two types of backlinks: dofollow and nofollow. A dofollow link helps the Google rank of whatever page it is linking to, and sends traffic. A nofollow just sends traffic (meaning people may still click it, which is great, but the link means nothing to Google). Backlinks that go to your Home page help to build “domain authority” with Google. They see your entire website as more trustworthy. Backlinks that go to a specific internal page will help that page rank higher in the search results for its target keyword. Finally, links from a high authority site (like a giant media company or a university) are going to carry more “link juice” than an unknown site that barely gets any traffic itself. On the local listing that we just talked about, those links will go to your Home page. So they will mostly help your domain authority. At this manual link building stage, your SEO pro is going to try to get a mix of links, some coming to your Home page, and others going to the internal pages (when relevant). The wrong SEO pro may have a bunch of existing websites that he will try to “link farm” back to your website. This might have some short-term positive effect, but usually you just end up getting punished by Google. So the right SEO pro is going to seek out chances to manually get a real link from a real third party website. Realistically, for a small business, he’s not going to be able to get a ton of crazy high authority links. As a starting point, any relevant link from an active website, no matter how small, is going to help. A lot of those places will have nofollow set up on their links. But even though the links aren’t bringing you any juice on Google, they could still drive real human traffic to your site. Since that is the ultimate goal, it’s not a bad thing. Often the best way to get high authority backlinks is to get your business mentioned by an influencer or media website. A high-level SEO pro might be well-versed in press releases, or he may be willing to network with local celebs that are relevant to your industry. If the right SEO pro is going to do this type of outreach, they will keep you in the loop. Read the press release, or vet the influencer, to make sure they’re the right fit for the company image you want to project. There are newspaper articles that look like interviews or special interest stories, but really they are just ads in disguise. This type of article would be great exposure for your business. Especially if the online version puts a proper dofollow backlink to your site. Ask your SEO pro if he has any connections or previous experience with this. There are some advanced tactics that the SEO pro may use. These may get time consuming or expensive. But it’s good to be aware of them, because they do work. Broken link building is just a specific type of outreach. The SEO pro will look for existing websites that link to competitors in your industry. If they find a link that goes to a broken website (or no website), they will pounce. Think of the scenario where the pro is working for an ethnic restaurant. He finds a local food blog that has a post about the Chinese restaurants in town. Maybe the post lists 3 restaurants, and links to the websites for each. But one of the restaurants has gone out of business. So when he clicks the link, it just goes to an error page. He will then email the blogger, tell them about the broken link, and let them know that his client’s restaurant is open for business. Another thing he could do is to go check out the website domain of the old restaurant that went out of business. Maybe it is available to buy. And when he runs it through his SEO software, he sees a bunch of blogs are linking to it. So for a few bucks he can buy that domain, and then set it to forward to his client’s website. This is the expired domain buying strategy. If he can find a few expired domains that are related to the industry, and that still have backlinks coming in from other sites, he can generate quite a bit of juice for his client’s site. Obviously this is a very simplified way of explaining it, but hopefully you get an idea of just how creative the right SEO pro can be. Up until now, we’ve just talked about ways to SEO your existing small business website. We went over the basic foundational pages. But often, your industry will have a ton of topics that have a high level of interest, that are not covered by your standard website. Then it’s time to start creating new content that fills in the blanks, answers the common questions, connects with your audience, and demonstrates your expertise. This content can be in the form of blog posts, audio or video recording, or infographics. It should be tailor-made to rank well in Google and bring in more traffic. That means the right SEO pro will go through all the steps we have covered up to now: keyword research, copywriting, on-page optimization, manual and outreach link building. 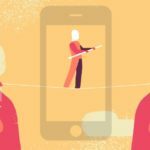 The content can be aimed at potential customers, or it can be aimed at influencers in your industry. The red flags are easy to spot here — if the content is solid, captivating, helpful, and unique, you have the right SEO pro. If it’s boring, copied, shallow, or sounds like it was written by someone with English as their third language, that’s the wrong SEO pro. 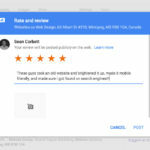 Google rewards quality, not quantity. So one or two solid blog posts are better than 20 sad posts no one wants to read. Just remember, from our keyword research step, that the right SEO pro is going to check if there is any interest in these topics (via search volume and intent) before he puts in the work. The powerful thing about content marketing is that, when it is truly helpful and unique, readers will end up promoting your content for you. You will get social media mentions and backlinks, without having to do extra outreach work. Of course, going viral is rare, but it becomes a powerhouse move for your company. Whether your content becomes a breakout hit, or just a steady, reliable source of traffic, this strategy will take at least a few months to show any tangible results. Pay-per-click ads don’t directly help your SEO. But they can be part of an overall strategy, especially with content marketing. We encounter a lot of people who are let down by their current website provider and/or SEO guy. And they often complain about spending a lot of money per month “to come in first on Google”. Usually what is going on is that their provider is buying Google ads for the most obvious (and expensive) keywords. So when the small business owner searches online, and sees their website come up first, they think it’s working. Usually this overly expensive traffic is being dumped onto their Home page, which is not at all optimized to capture leads. It may generate some interest, but it is the laziest (and we feel, somewhat dishonest) way of using online ads. It’s also worth pointing out that some searchers know the top results are paid ads, and will skip them in favor of the first organic results. The right SEO pro may still decide that ads are an effective way to improve your overall SEO strategy. He may need a bunch of traffic to test certain keywords or messages. But since he’s just started your SEO work, you just don’t have enough visitors yet. The ad can be a shortcut to drive traffic to your site. This sudden influx of traffic makes potential customers more aware of you. Perhaps they spend some time reading your site. Google will look at the people on your website, and if they are not immediately clicking away, this may send a signal to Google that your site is relevant and helpful. Also, the people who read your site might mention your company to others. So, by increasing your reach and getting more readers on your site, it could indirectly help SEO. 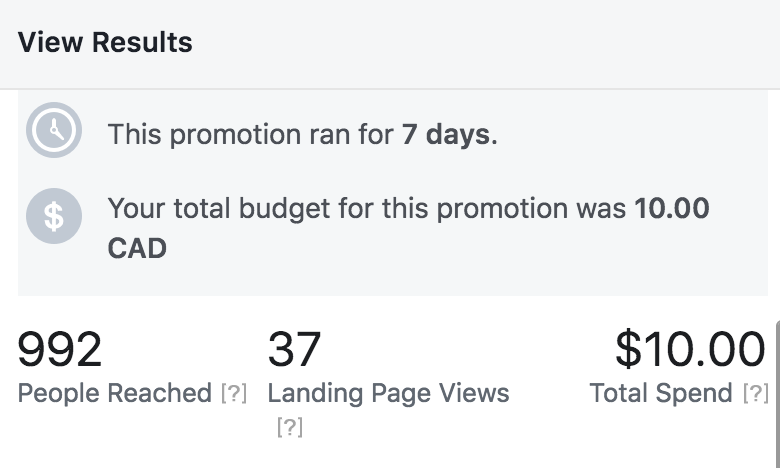 Paid promotion also plays a part in content marketing. To take a simple (and cheap) example, let’s say your SEO pro writes a great article that you know your customers will appreciate. 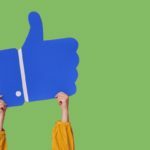 You do all the right things — you send an email to your contact list, and you post on Facebook about it. Yet Facebook will only show business posts to a tiny amount of users. Even when those users chose to follow the business, Facebook still won’t show every post to them. So the right SEO pro could do a simple “boost”. For around $10 your reach can increase by hundreds, even thousands, of readers. Getting those first hundred users to your content may be the start of the momentum that gets you ranked higher on Google. So, while paid ads are not an essential part of SEO work, you can see how they provide support to an overall strategy. As you can see, this guide is massive, and we’ve covered a lot. Even if you hire the right SEO pro, it helps to know roughly what’s going on. Then, for even more security, you can set up a few free tools to monitor everything. Google Analytics will show you all the stats you need to know about traffic and users. 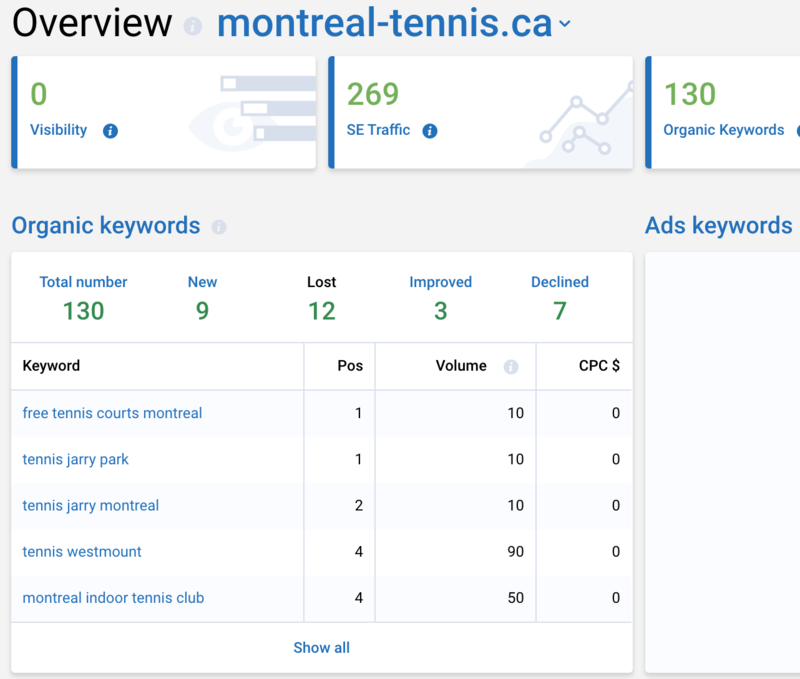 Google Search Console will show you the keywords that you rank for. Before even hiring an SEO pro, we recommend that you set up accounts for both of those tools, and get a baseline measurement of your traffic and ranks. Then, as the pro does the work, you can check the metrics to see if you rank higher on Google for the target keywords, and if you are getting more page views. How Can You Tell If SEO Is Worth The Cost? Ultimately, the traffic needs to translate into profit. If you sell a high-ticket service to a select group of people, you obviously need less leads. If you sell a very low-cost product, you may need to generate a ton of volume. And more than that, do you know the lifetime value of a client? Let’s say that for every 10 new visitors to your website, 1 ends up becoming a client. Maybe they pay you $100 for your service or product. But the SEO pro needs to charge you $500/month, and he only gets you 10 more visitors. It’s a trick question, because we are missing one important piece of the puzzle. That first-time customer may come back in the future and spend more with you. They may end up referring another customer. Lifetime value of a client could easily be $500+ dollars. As you can see, you don’t just throw some darts at the board, pay for some traffic, and hope it “feels right”. The bottom line is if the SEO work will drive enough traffic to your site to result in new clients whose lifetime value is equal or greater than what you are paying the SEO pro. Since you’ve taken the time to read this entire guide, you can appreciate the amount of thought that goes into SEO. Like we said, Google rewards websites that give searchers a good experience. So the final thing to understand is that, even with the best SEO on the planet, if people don’t find what they are looking for when they come to your site, you’re going to lose. The SEO pro is unlikely to be able to help with those issues. However, they may be able to suggest design or content changes that will keep visitors on the page longer, or convert more of them to leads. If you’ve tried everything else, it’s worth testing their suggestions. This guide covered everything you need to know about vetting, hiring, and monitoring an SEO pro to help you get on the first page of Google. You’ll find that, when you hire the right pro, your results will improve after only a fraction of these steps are properly executed. But a lot of these topics can be confusing. That’s why we’ve given you a complete reference guide for any issue that might come up. Good luck with improving the SEO of your small business website! Note: some pros may suggest using Schema Markup, and even though we think it’s a great idea we decided to cover it in a separate article, since the SEO effects are secondary.